I can't believe Wrennyn is going to be 18months old on the 30th. He has changed so much this past month, and it is making me realize that he is now a toddler and my little baby boy is growing up, no matter how strongly I try to deny it. He is very sure of the things he wants and he doesn't back down easily, this is a very difficult trait to parent, but I know it is a handy personality feature when peer pressure comes into play in the later years of life. Wrennyn's first year and a half had been an emotional journey for me. It is hard to see myself without a baby in my arms anymore and the reality of not going through another pregnancy is starting to set in. I feel like some of us moms will always crave the intimacy of those first weeks of motherhood no matter how many children we add to our brood, but at some point it is time to let go and move forward in life. I am actually looking forward to the days when we can go to the park and I don't have to hoover over a child full-time. Having 3 boys I picture the adventures we will go on and I think I am ready to have those moments where we are all just having fun together and enjoy learning something new together. I am ready to go through life with these boys and really spend time with each of them. Having a baby around I feel that I am constantly just telling the older boys what they can and can't do. I feel like my time is spread very thin and my enthusiasm for participating in what they have going on has dwindled. I am ready to start being a friend to my boys. I want to be someone they love to hang out with and come and tell stories to. There is no doubt that I have distracted myself with other things recently and I am just trying to be more proactive about what kind of woman I present myself as, to my boys. I learn so much in the beginning phases of motherhood with each new little child and personality filling our home, and now I am ready to not only parent each of them as their unique, tender souls need, but I am ready to try and be there friend, and be someone they love to laugh and be with. No doubt I will need to make some serious changes and adjustments, but you have to start somewhere right?! I love having little Wrenny in our lives and I am excited to see my boys go through childhood adventures together! 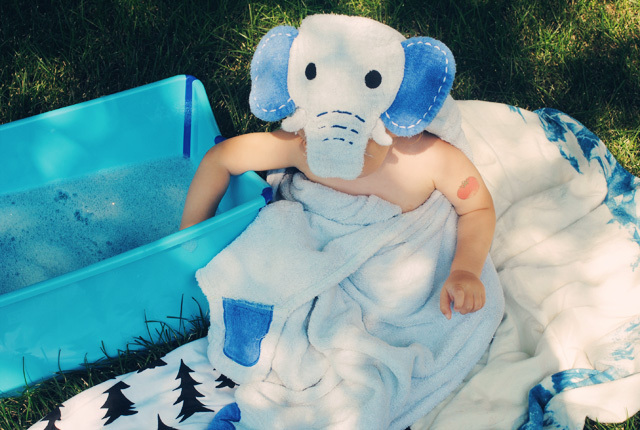 a little outdoor bath is good for the soul! 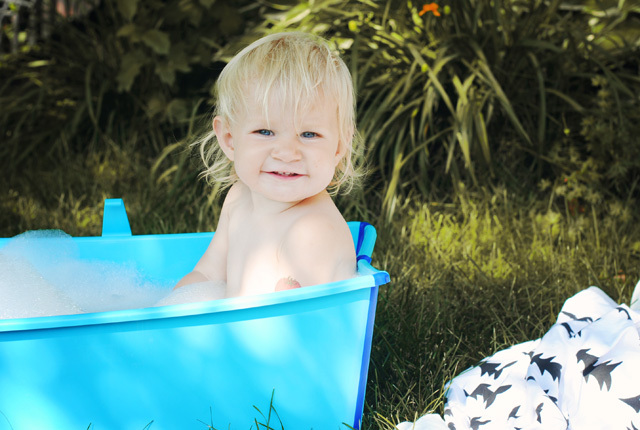 flexibath c/o Stokke we love using it for a little outdoor relaxation! So cute! Love that little towel! ohh he is adorable. & your dress is swoon worthy! All your little blondies are so so cute and growing so fast! When I look at your boys, I then look at mine and think holy hell how are they not tiny little babies anymore! I can't blame you on the being stretched too thin, I'm ready for that to be over as well and just enjoy!